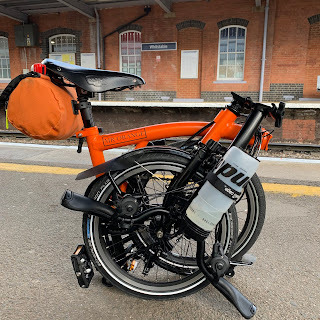 My Orange Brompton: Police Officers riding Brompton Folding Bikes! I have been enjoying the better weather and have been out and about on my beloved Brompton. While out I saw a couple of Police Officers on their customary mountain bikes. It occurred to me that surely in an urban environment a Brompton would be the perfect form of transport? Just imagine what it would look like - pretty cool I would guess. If they were ever used by the Police just imagine how this would filter into television programmes. There might be the odd chase scene in major cities on Brompton folding bikes. The possibilities are endless. They could fold up in under 10 seconds (as they would be trained at Hendon to do so before being allowed to ride a Brompton) and run across said grass and muddy park!